The Ryehouse Plot was a scheme in 1683 with the object of assassinating King Charles II and his brother James, Duke of York (later James II ) in order to secure the succession of the Duke of Monmouth, an illegitimate son of Charles II and Lucy Walter. 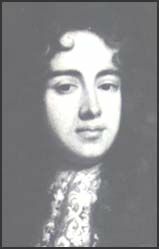 Born in 1649 he was raised by Lord Croft and made Duke of Monmouth in 1663. He later married the wealthy Ann, Countess of Buccleuch. The plot was intended to put him on the throne in place of his father ( and in lieu of the openly Catholic James). The hope was that the Protestant people would rise up, but they had already had enough of civil war and the rebellion failed. At the same time the 9th Earl of Argyll mounted an invasion of Scotland, but his plan also failed for lack of support; he was was caught and executed. In England during 1682 plans were being made to further a revolution which would leave a constitutional monarchy but exclude the accession of James. The main conspirators were the Duke of Monmouth, Lord William Russell, Lord Essex and Sir Algernon Sydney. Monmouth had commanded the royalist forces against the Covenanters at Bothwell Brig . The others were patriots concerned that James, a Catholic, would succeed to the throne. They were in contact with the Earl of Argyll and had thoughts of collaboration with him for simultaneous revolution in Scotland and England. They suggested a variety of venues and methods to take the King and his brother. Proposals included shooting them from Bow Steeple, attack them in St James Park; or in their barge on the river Thames. Outside London they considered the road between London and Winchester; the road betwen Hampton Court and Windsor. Finally a conspirator named Rumbold ( a fearless officer from the Ironsides and a staunch republican) offered his home – Rye House as a base, about eighteen miles from London. The King and Duke of York were known by various nicknames – ` Slavery` and `Popery ` were one label , another was after their complexions – Charles was dark complexion and called ` Blackbird` while James , Duke of York, was fair and called ` Goldfinch`. There were several suggestions how they might be killed but eventually the conspirators met at Rye House, near Hoddesdon in Hertforshire to make their final plans. Near to Rye House ran a narrow lane that was regularly used by the King when he went to Newmarket. Along it was a thick hedge on one side and on the other an outhouse that afforded good cover and vantage for the assassins. The house itself was surrounded by a moat and was easily defended by a small party if needs be. But there was no attempt made on the King`s life for he returned from Newmarket a day earlier than anticipated. The plot was discovered and Lord William Russell and Algernon Sydney were beheaded. The Rye House Plot was the excuse the government needed to arrest the chivalrous patriot Robert Baillie of Jerviswood. Baillie had been in London and had discussions about the establishment of a settlement in Carolina. In the course of several meetings there had been discussion about the succession and what might be done about it. Baillie recognised the desirability of doing something to prevent the Catholic Duke of York from the throne, but assassination was not one of them. Baillie and his fellow Scots* were arrested and sent to Edinburgh in October 1683. He lingered in the Tolbooth suffering ill health, but was eventually tried for high treason, found guilty by a packed jury ( nothing was left to chance) and executed 23 December 1684. *These were: Sir Hugh Campbell of Cessnock, Sir George Campbell his son; Sir William Muir of Rowallan, and William his son; John Crawford of Crawfordland; William Fairly of Bruntsfield; Alexander Monro of Beancrofts; William Spence; Robert Murray; John Hepburn; and William Carstairs. Carstairs was another staunch Presbyterian who was tortured by the Privy Council but escaped the death penalty to see the Revolution and accession of William and Mary. He was held in high regard by King William.